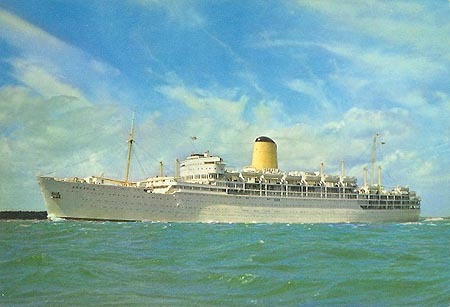 This page is devoted to postcards and photographs of the P&O liner Arcadia (2) of 1954. 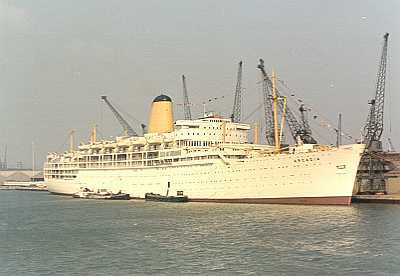 Arcadia (2) was built by John Brown of Clydebank in 1954. 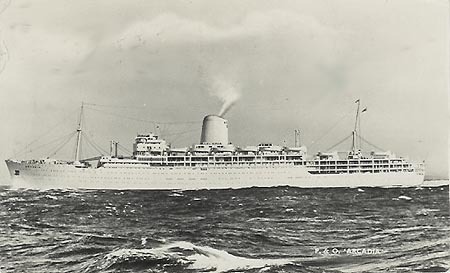 Her sistership was the Belfast-built Iberia (2) of the same year. They were easily distinguishable due to different funnel tops. Arcadia received full air-conditioning on a refit in Belfast in 1959. 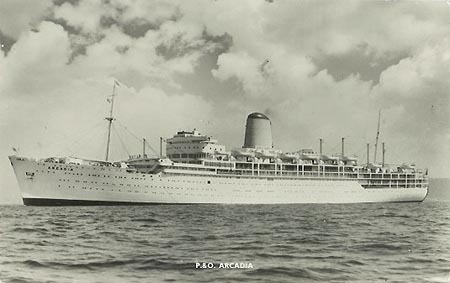 Arcadia operated on the UK-Australia passenger service, with increasing numbers of cruises. 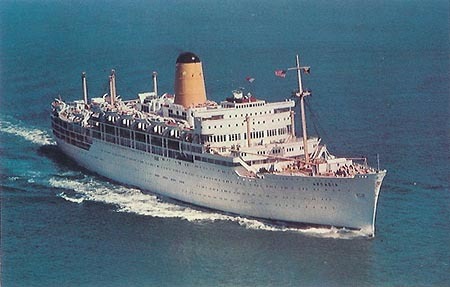 In 1970 she became a full time one-class cruise ship. 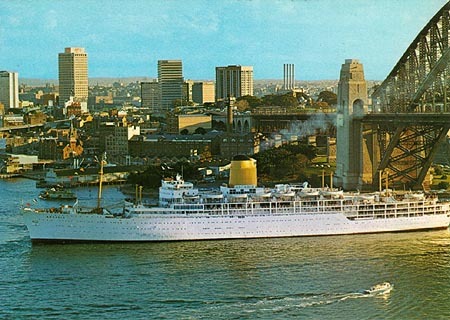 In 1976, Arcadia (2) was permanently based out of Sydney. 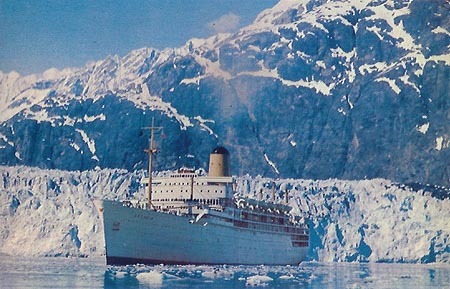 She was scrapped in Taiwan in 1979. Arcadia (2) - 1954-1979 - The second P&O Arcadia - this page! P&O official postcard of Arcadia (2). 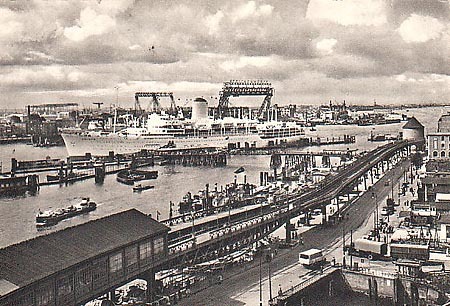 An early card before the black funnel cap was added. 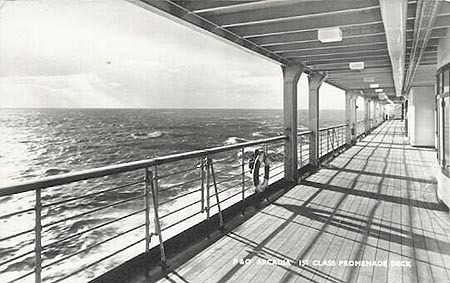 This card was also included in the official P&O postcard set. 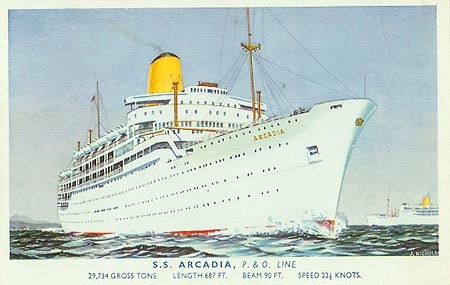 P&O official art postcard of Arcadia (2), posted from Southampton on 14th July 1957. The painting is based on the photographic postcard above. The message reads:- "Have just boarded, weather nice & fine. Of course have not yet got acquainted with any of the passengers. Seems a nicer ship than the Orcades, will write you later." J.Arthur Dixon postcard SS.750 of Arcadia (2). Photo: &COPY; Beken & Son, Cowes. 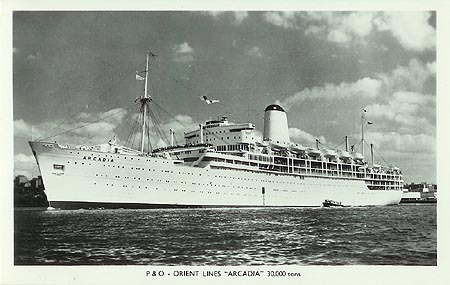 P&O official postcard SC14120 of Arcadia (2). 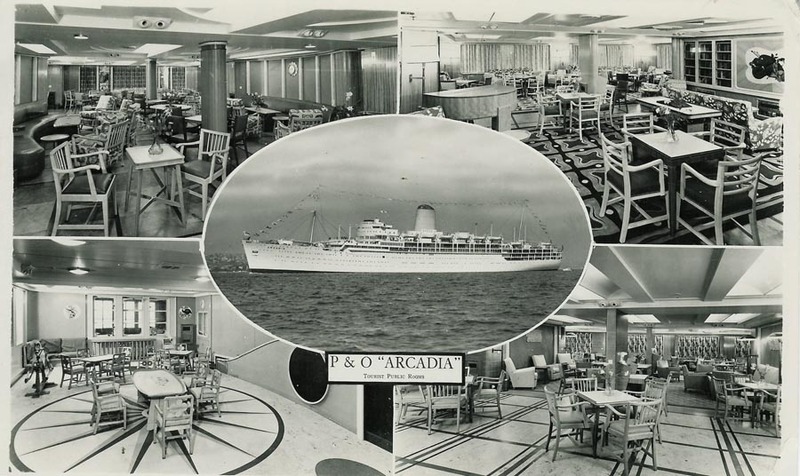 P&O official postcard SC14123 of Arcadia (2). Salmon postcard 5265 of Arcadia (2). 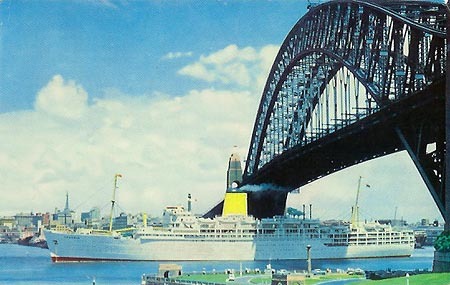 Postcard of Arcadia (2) at Sydney, posted April 1965. 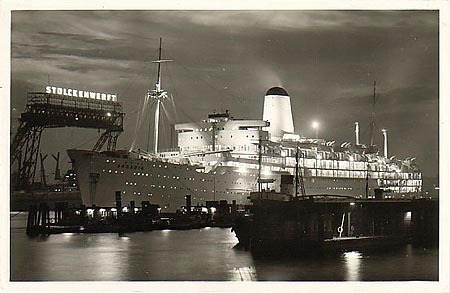 Postcard of Arcadia (2) at Sydney. 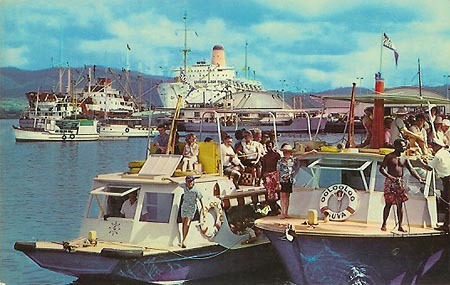 Postcard of Arcadia (2) at Suva Harbour, Fiji. 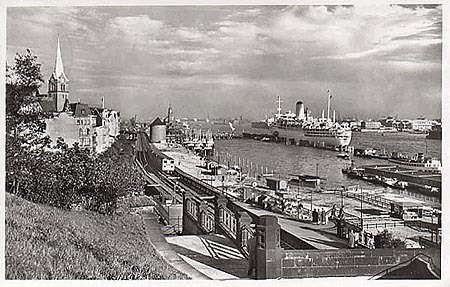 Postcard of Arcadia (2) at Hamburg. 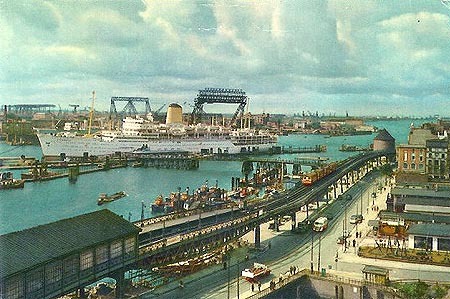 Colour postcard of Arcadia (2) at Hamburg. Same viewpoint, but different image to the card above. 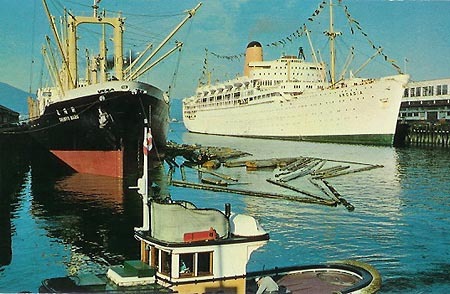 Postcard of Arcadia (2) at Vancouver. 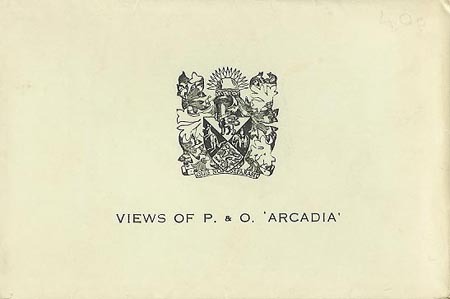 The P&O official postcard sets of Arcadia (2) were supplied in this envelope. Different sets were supplied to different classes - the set I have showed 1st Class only, but I have shown other single cards acquired of Tourist Class. 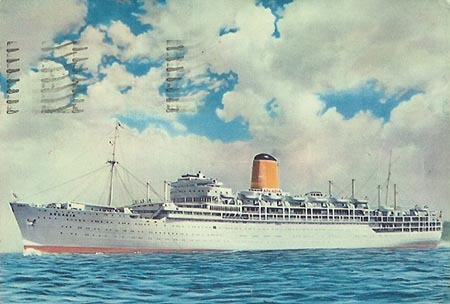 This P&O official postcard of Arcadia (2) was included in the set. 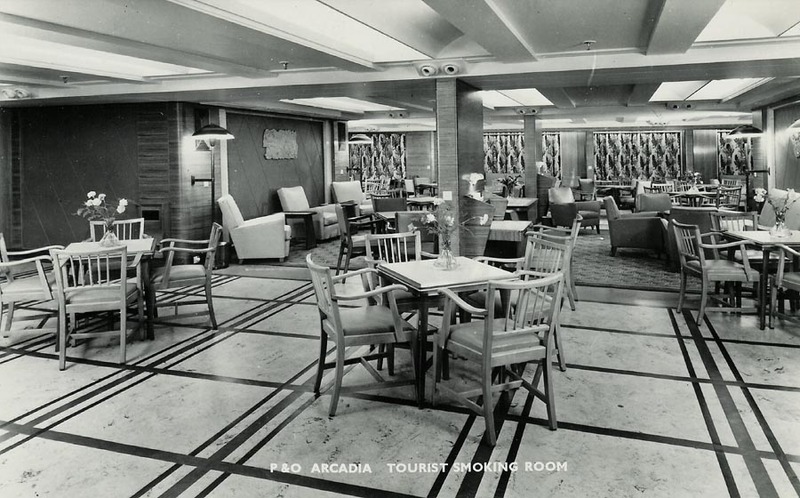 P&O Arcadia - 1st Class Promenade Deck. 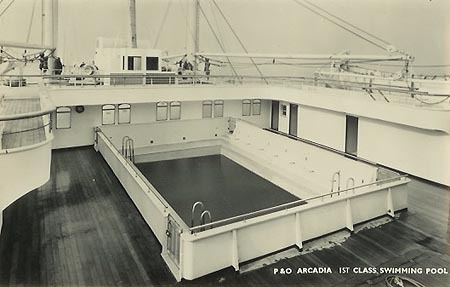 P&O Arcadia - 1st Class Swimming Pool. 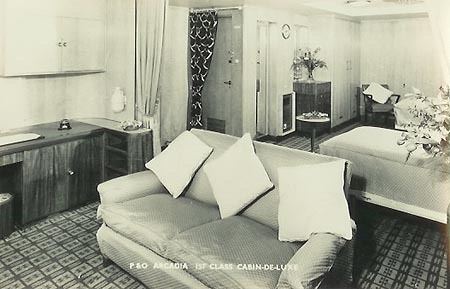 P&O Arcadia - 1st Class Cabin-de-luxe. 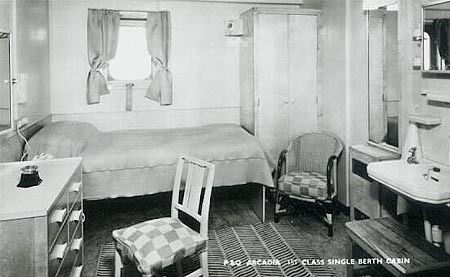 P&O Arcadia - 1st Class Cabin. 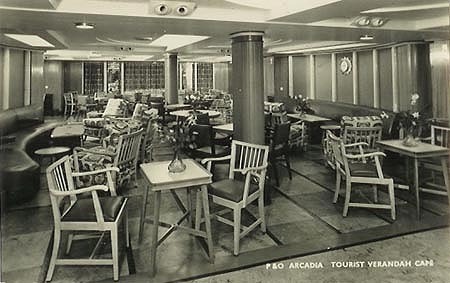 P&O Arcadia - 1st Class Verandah Cafe. 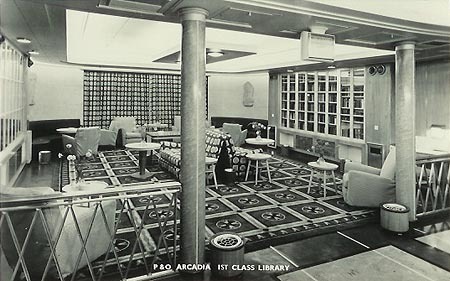 P&O Arcadia - 1st Class Library. 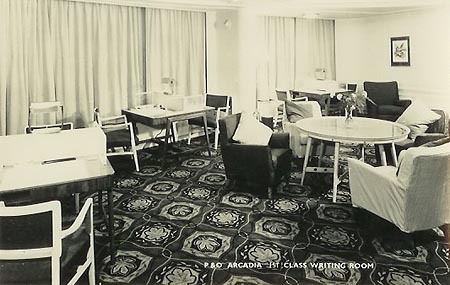 P&O Arcadia - 1st Class Writing Room. 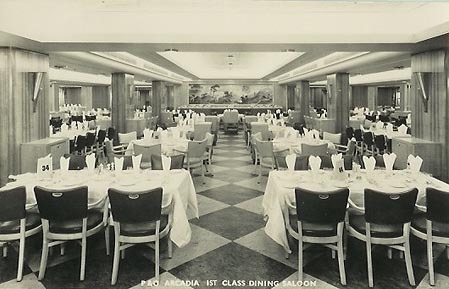 P&O Arcadia - 1st Class Dining Room. 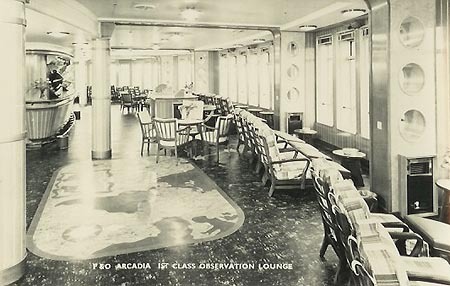 P&O Arcadia - 1st Class Observation Lounge. 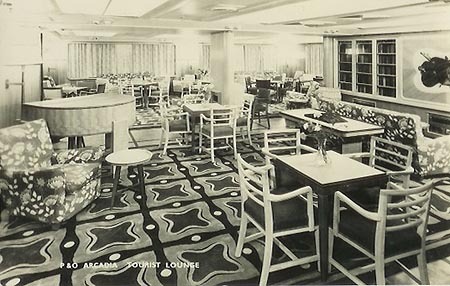 P&O Arcadia - Tourist Class Multi-view card. 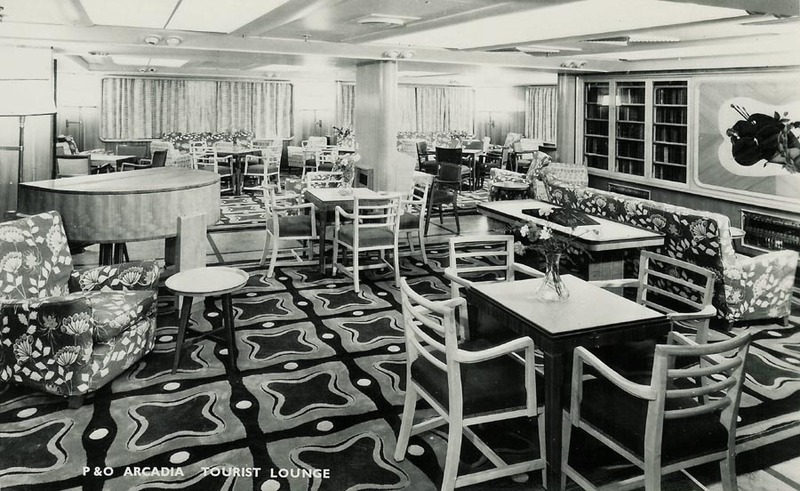 P&O Arcadia - Tourist Class Lounge. P&O Arcadia - Tourist Class Smoking Room. 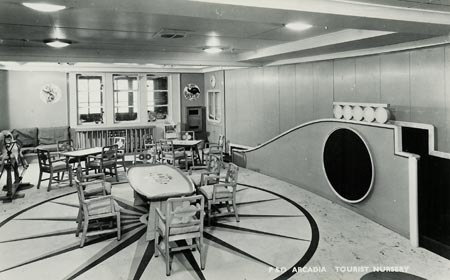 P&O Arcadia - Tourist Class Nursery. 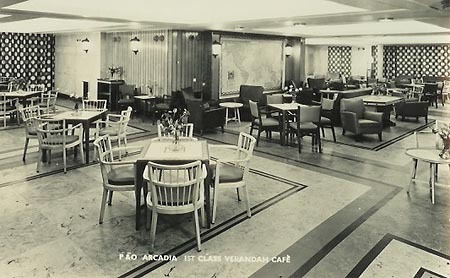 P&O Arcadia - Tourist Class Verandah Cafe. 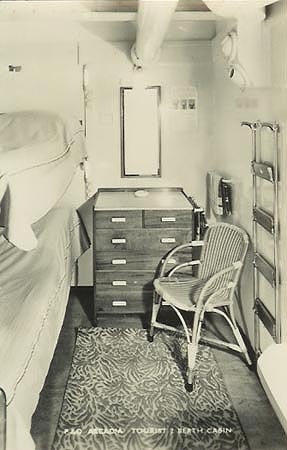 P&O Arcadia - Tourist Class Cabin.